I absolutely love love love Valentine’s Day! I have such fond memories thanks to my sweet dad who always left a small box of chocolates for his 5 daughters on VDay. And what’s even sweeter is he drives all over town so when we wake up now as adults, we still get a box on the front porch. I know, luckiest daughters ever! LOVE how it’s not just a holiday for romance, at least not for my family. So when I saw this display at Christmastime, I knew I wanted to knock it off for Valentine’s Day. 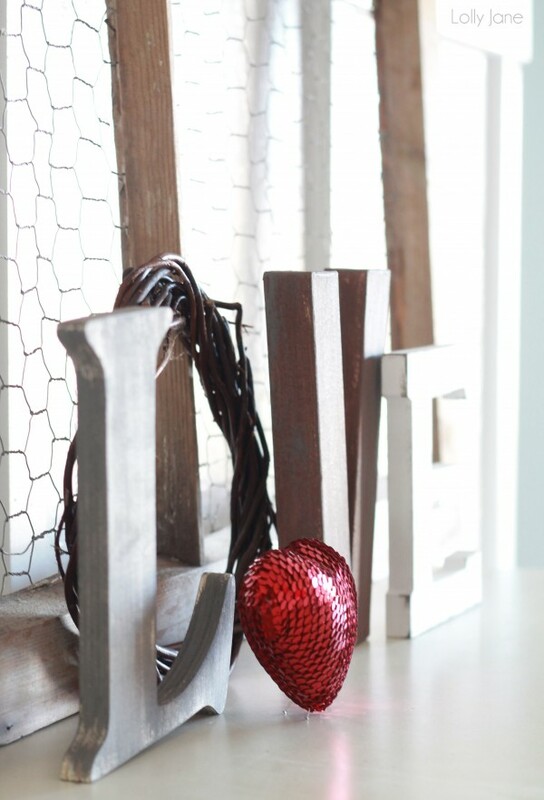 And since it’s a neutral rustic pallet, you can use it year round as well…score! 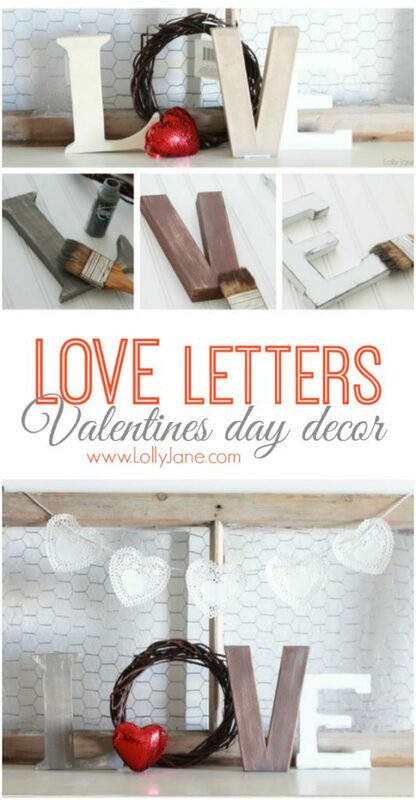 But I’m diggin these valentines day love letters mantel decor for the big lovey dovey day as well. What I love is how little I spent to create this look. I bought the grapevine wreath from the dollar store, score! 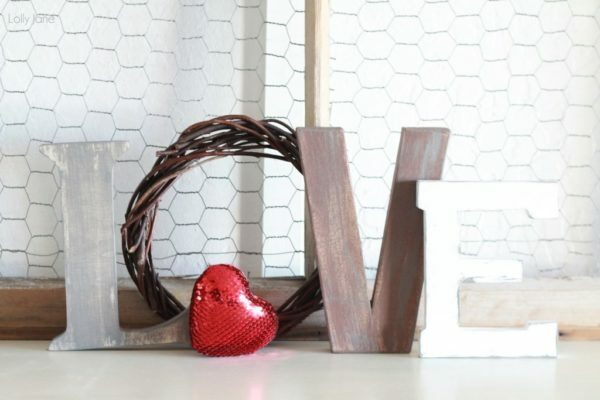 The letters and sequin heart were all from JoAnn’s and they took 40% off coupons from their app as well as 2 other craft stores apps. Nice! PLUS she honored an additional 10% off coupon so these were super cheap, my fav. 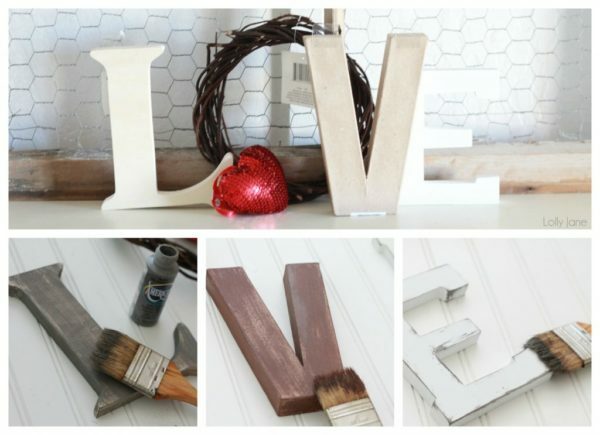 I wanted a neutral color pallet for these letters so I can use them in my master or in the house year round. Since love is so universal, it works! I used Deco Art’s Americana craft paint to create the paint technique. I took a dry paintbrush and lightly dipped it in the top of the paint bottle. I dry brushed the Neutral Grey over the L and only the edges of the already white E. The V was dry brushed in Espresso then lightly again with the grey. So easy. I mean, so stinkin easy that my 9 year old could have done this in minutes, like I did. Love a fast and cheap project! 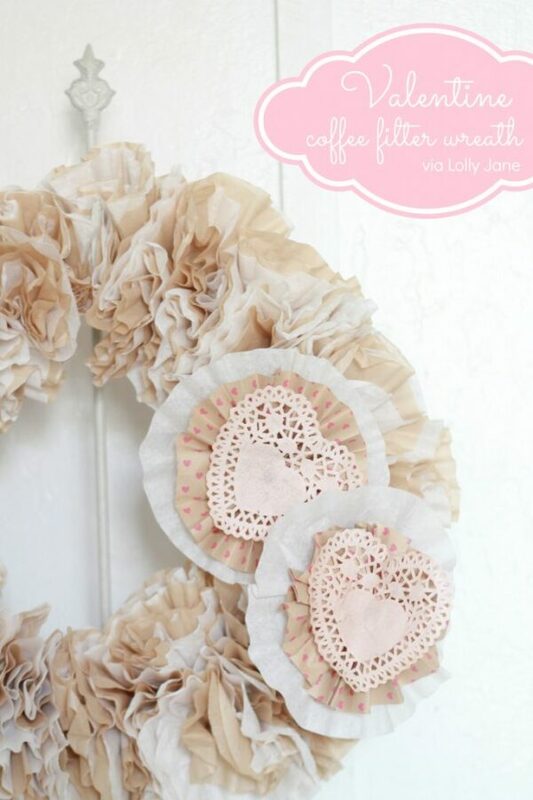 The heart I bought originally had ribbon to hang it but I ripped it off. I decided I wanted it to stand up so I used 3 pins and pushed them in a triangle shape in the bottom so it’s now freestanding. I think it’s cute either way. Which way do you like it better? 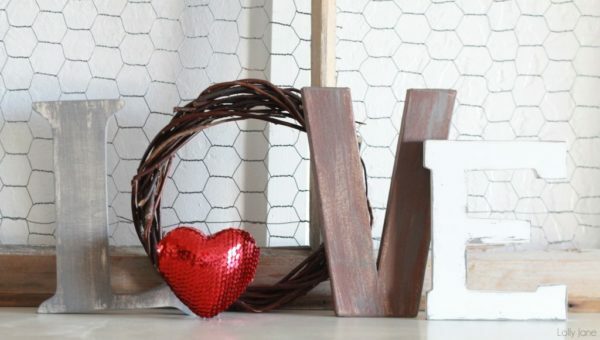 Is it too early for Valentine’s Day decor?? I hope not, we’ll have lots of tutorials coming up in the next couple weeks! 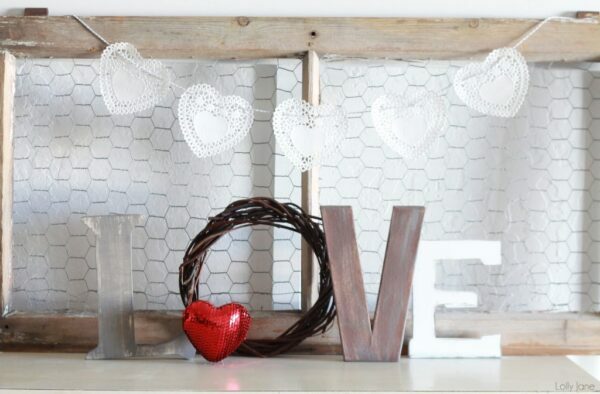 Come back tomorrow for a simple bakers twine lace doily bunting…. 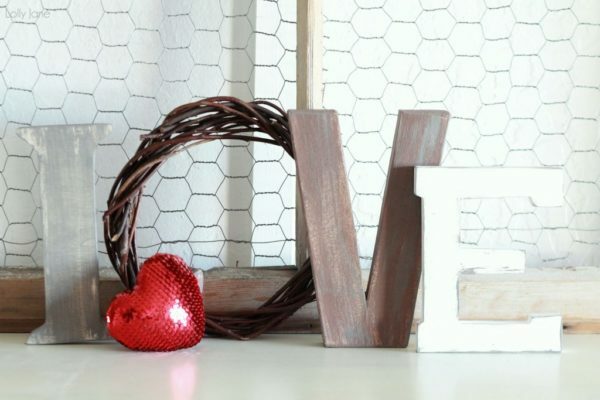 Check out all our Valentine’s Day ideas here! 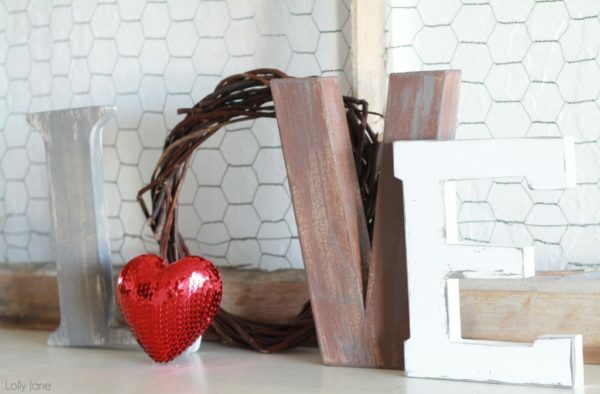 as well as our inspirational round ups like our 17 Valentine’s Day decor ideas! 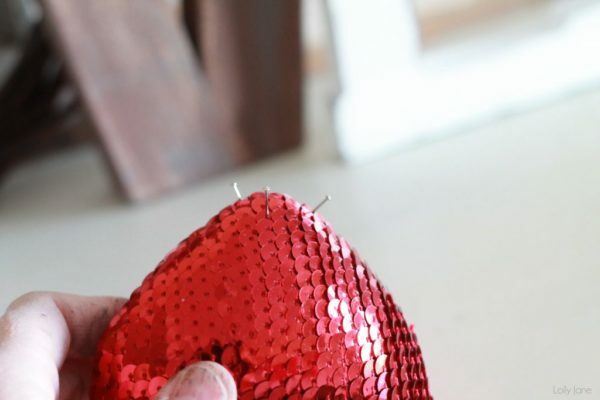 Ok, so the heart with pins to stand up is freakin genius! I also love the new tabs on the side bar. I just love you..both..a lot! So cute! And super clever using the pins to stand the heart up. Love the makeover the letters received!!! Thanks, Michele! Can’t beat cheap and easy! Love your letters! And the little heart is so cute too. Saw you sharing at Transformation Thursdays. What size grapevine wreath worked? Wondering where you got yours? how simple and adorable! love it. He’s the best, we’re so blessed to have him! This is so cute! The heart really punches is up. What’s not to LOVE about the word LOVE being displayed 🙂 So So So cute!! I especially Love the NIFTY way you decided to make your Heart stand… It’s like a Heart Space Ship just Landed on your Mantel. This is so cute!!! 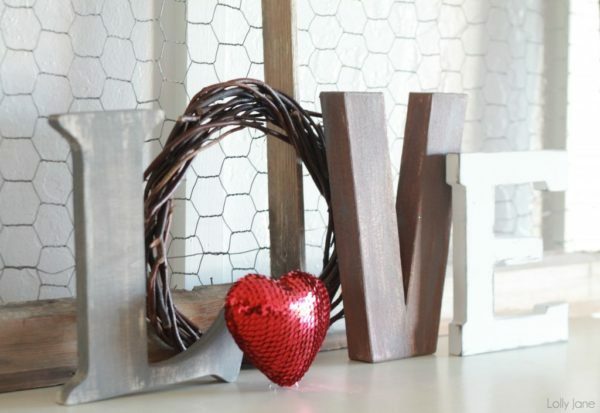 I am totally doing this for my valentines mantel. I cannot wait to go to JoAnn’s. 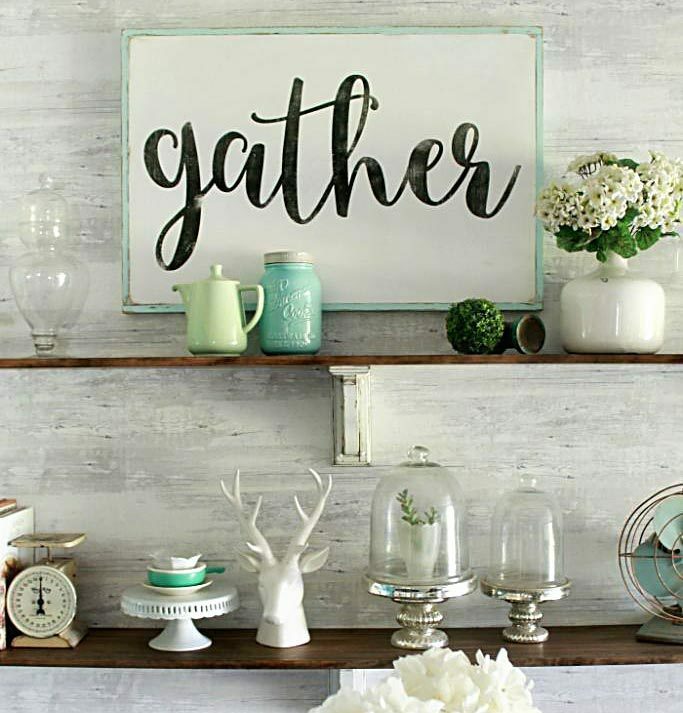 This mantel is darling, but please tell me you haven’t put this up yet! My mantel is still in its Christmas mode. I like to leave Christma decor up in my house through the first week of January. Seriously cute, Kelli! I especially love that you were able to stand the heart up using the three little pins. I’ve never thought of that! Too cute! Love Love Love this idea! I hope to give it a shot to have around as a photography prop. I think this would be gorge in a family or couples session! So cute! I love your idea of how to stand the heart up. Very cute idea. Love your blog. Very cute! I love the wreath for the “o”! Thanks for the inspiration!!! So cute! I was wondering what size letters you used?